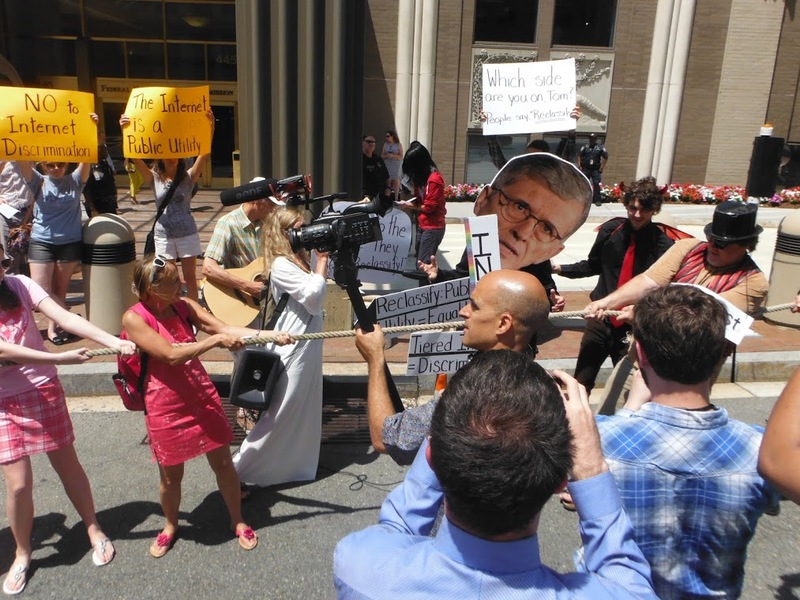 Scenes from the Save the Internet Musical Action outside the FCC. Photo Credit: Free Press. Licensed CC-BY-NC-SA. Earlier this year, the Federal Communications Commission voted to ease the way for cities to become Internet service providers. So-called municipal broadband is already a reality in a few towns, often providing Internet access and faster service to rural communities that cable companies don’t serve. The cable and telecommunications industry have long lobbied against city-run broadband, arguing that taxpayer money should not fund potential competitors to private companies. The telecom companies have what may seem like an unlikely ally: states. Roughly 20 states have restrictions against municipal broadband. And the attorneys general in North Carolina and Tennessee have recently filed lawsuits in an attempt to overrule the FCC and block towns in these states from expanding publicly funded Internet service. North Carolina’s attorney general argued in a suit filed last month that the “FCC unlawfully inserted itself between the State and the State’s political subdivisions.” Tennessee’s attorney general filed a similar suit in March. Tennessee has hired one of the country’s largest telecom lobbying and law firms, Wiley Rein, to represent the state in its suit. The firm, founded by a former FCC chairman, has represented AT&T, Verizon and Qwest, among others. James Tierney, director of the National State Attorneys General Program at Columbia Law School, said it is not unusual for attorneys general to seek outside counsel for specialized cases that they view as a priority. As the New York Times detailed last year, state attorneys general have become a major target of corporate lobbyists and contributors including AT&T, Comcast and T-Mobile. North Carolina is no exception. The state’s Attorney General Roy Cooper received roughly $35,000 from the telecommunications industry in his 2012 run for office. Only the state’s retail industry gave more. The donations are just a small part of contributions the industry has made in the states. In North Carolina’s 2014 elections, the telecommunications industry gave a combined $870,000 to candidates in both parties, which made it one of the top industries to contribute that year. Candidates in Tennessee received nearly $921,000 from AT&T and other industry players in 2014. The FCC’s decision came after two towns – City of Wilson in North Carolina and Chattanooga in Tennessee – appealed to the agency to be able to expand their networks. If the court upholds the FCC’s authority to preempt restrictions in North Carolina and Tennessee, it may embolden other cities to file petitions with the agency, according to lawyer Jim Baller, who represents Wilson and the Chattanooga Electric Power Board. “A victory by the FCC would be a very welcome result for many communities across America,” said Baller. For some residents in and outside of Chattanooga, clearing the way to city-run broadband would mean the sort of faster Internet access that others might take for granted. For 12 years, Eva VanHook, 39, of Georgetown, Tennessee, lived with a satellite broadband connection so slow that she’d read a book while waiting for a web page to load. In order for her son to access online materials for his school assignments, she’d drive him 12 miles to their church parking lot, where he could access faster WiFi. Originally published at ProPublica. Sign up for their newsletter.